Around 400 fans flocked to Argentina's base camp on Monday for the team's first open training session, each and every one desperate to steal a glimpse of Messi in the flesh. BRONNITSY (RUSSIA): Lionel Messi's arrival in Bronnitsy, a quiet town with 20,000 residents some 50km southeast of Moscow, has brought an unprecedented level of attention to a place most renowned for its Archangel Michael cathedral. But as the euphoric shouts echoing around a temporary stand suggests, its selection as Argentina's team base camp has transformed it into one of the epicentres of the World Cup. Flags bearing Messi's face hang over barriers, while a giant mural of the Barcelona star towers above the people of Bronnitsy as they come to terms with the intense spotlight now fixated on their hometown. Never has it been subjected to such scrutiny, and perhaps never again will this town founded in the middle of the 15th century attract such global recognition. None of them were yelling "Aguero", "Mascherano" or "Higuain". They were all waiting for Messi to emerge from a building by the training ground and began to eagerly chant his name. "Messi! Messi!" they screamed, trying to draw the attention of the five-time Ballon d'Or winner. He duly obliged, staying behind to sign autographs and posing for photos at the end of the hour-long session, during which his every touch was warmly applauded. The bleachers were full to overflowing and trembled with emotion. But supporters there weren't the only ones who didn't want to miss out, Argentina's ambassador to Russia, Ernesto Lagorio, was also in attendance. "It was great, it went very well, it's been a nice afternoon," he told AFP. Others like physical education teacher Lucas Ledezma, who waited for the team's bus to arrive last Saturday, repeated that same sentiment. "We dream that we can do it, I think it's a World Cup the national team deserves, that Messi deserves and that all us Argentines deserve," said the 30-year-old Ledezma, who left the Argentine city of Cordoba in on January 5 and cycled 14,000km to follow the Albiceleste. 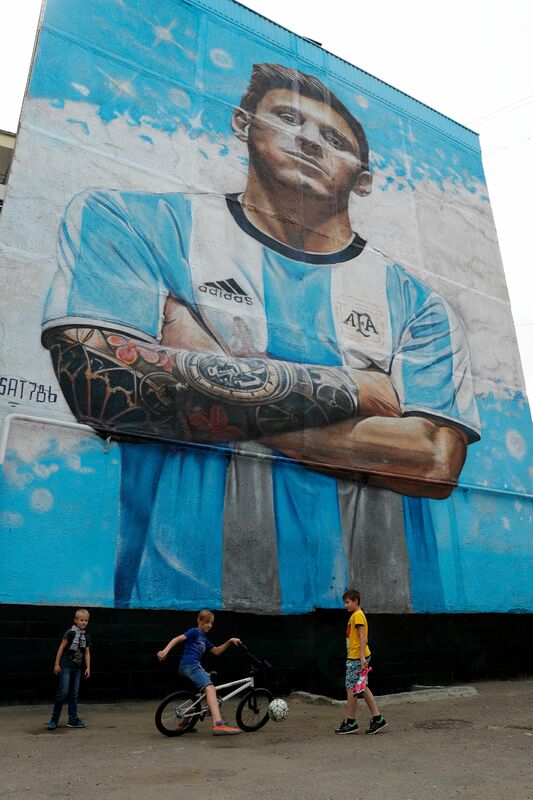 If anything is on a par with Messi these days it could be the enormous mural of him that stares out at passers-by on one of the streets adjacent to Bronnitsy's main road. "When I was painting Messi, I was painting a legend of my time. Messi is one of the best players (in the world)," said 29-year-old street artist Sergey Erofeev, who was commissioned to redesign the wall after winning a competition. Erofeev, still with paint splattered on his trousers and in broken Spanish that he only recently learned, confessed he has a dream of his own. "I want Messi to come and see my work," he said. Close to Argentina's training base is a house that has been converted into a makeshift sports bar serving "Mate Listo", a version of the caffeine-packed drink popular in South America. It's impossible to walk through Bronnitsy without hearing Messi's name, mostly in conversations between locals, and his image is everywhere you turn. Only his presence, and the stringent security surrounding him, have managed to alter an otherwise peaceful day in a town that has openly welcomed the striker despite struggling to get close to him.